For sixteen days all anyone talked about was horse, horse, horse. The Alltech 2010 FEI World Equestrian Games had come to town. Even picking up a carton of milk could get you into a conversation about horses. This is not unusual in Lexington, Kentucky, where the person passing the collection plate in church will lean down and whisper, “Congratulations on your win at Keeneland”. 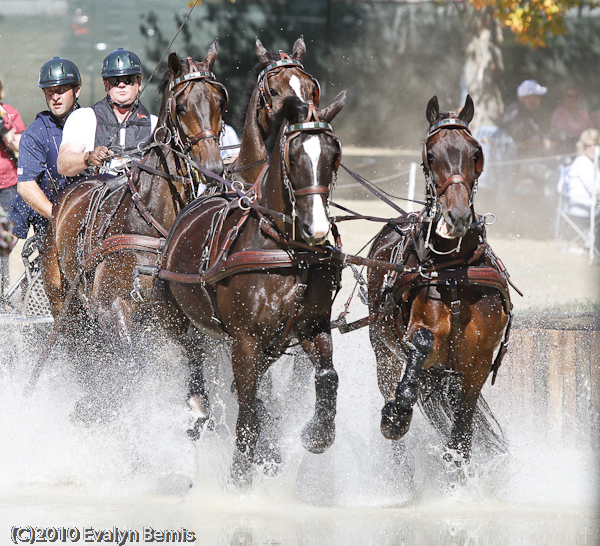 From September 25 to October 10, 2010, the self-proclaimed Horse Capital of the World was inundated with horse enthusiasts from around the world, come to watch 632 athletes and 752 horses from 58 nations vie for championships in 8 equestrian sports. 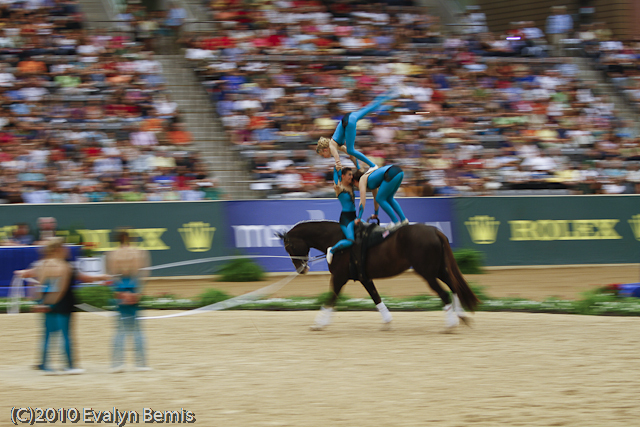 You could be seated in one of the many competition arenas at the Kentucky Horse Park or taking in a demonstration by equestrian luminaries such as Pat Parelli, Stacey Westfall or the California Cowgirls. You could be visiting Molly the three-legged pony in the Equine Village and if you were young and sweet she’d let you stroke her face and you might even get to see the smiley-face on the bottom of her prosthetic. Everywhere you went you surrounded by horse-lovers. Of course there were pony rides - 10-year old Macey said that was the best thing about her visit to the World Equestrian Games. You could try a Reining spin on a real horse during daily NRHA exhibitions in the trade fair or try Cutting aboard a mechanical version. Little girls got their Breyer model horses autographed by famous athletes such as Steffen Peters and McLain Ward. If you were a guy dragged to the show-grounds by your horse-crazy wife you could still talk horses, horsepower that is, at the Land Rover test site. Or check out the latest in horse transport, a Theault Morpheus horse van. Built on a Mercedes chassis and with a turbocharged diesel engine that gets 18 mpg, the $125,000 2-horse van is scarcely larger than a delivery truck for ease of getting around and as the literature says, has “various options and embellishments” to insure the safety and comfort of your equine pals. If you didn’t have to be at the Games every minute you could venture to Claiborne Farm to visit Secretariat’s grave – so many people did that guests had to be turned away. Ashford Stud was a popular place to tour, with its fabulous stone barns modeled after the famous Coolmore Stud in Ireland. So international was the scene there that Beatrice Mertens, the Belgian breeder and owner of British Jumping team member Michael Whitaker’s horse Gig Amai, stopped by during a break in the WEG to discuss racing bloodlines with Ashford’s Irish-born stud manager. Visitors admired leading sire Giants Causeway and marveled to learn that until recently, his breeding fee was $300,000 and he bred 200+ mares, live-cover, 4 times a day. Now you can send your race-bred mares to him for a mere $100,000. Lexington had won the right to host the Games with the support of locally-based title sponsor Alltech. This was the first time the Games were held outside of Europe since 1990 when the FEI had the idea of holding multiple world championships in one location. Something like 550 horses were flown in from around the globe – reported to be the largest-ever airlift of horses. Lexington spent the better part of four years getting ready for WEG, transforming the Kentucky Horse Park into a spectacular venue. Numbers aside, the Games were successful in the most important way – good sport and sportsmanship. There were surprise outcomes, odds-on-favorite winners, heartbreaking stories and runs of bad luck, but the medal winners were the best of class on the day. Through it all shone many class acts of horsemanship and camaraderie. The whole Dutch dressage team was in tears for Adelinde Cornelissen when her horse Jerich Parzival was eliminated in the middle of their test for blood in his mouth. Apparently the horse bit the tip of his tongue during a rein-back. Stephen Clarke said it was possibly the worst moment of his judging career to ring the bell but the rule was unequivocal and based on the welfare of the horse. “Adelinde was obviously unaware, but as soon as I stopped her, she turned her horse’s head, saw what I had seen and that was the end of the discussion. She was completely gracious about it, no arguing, despite what must have been a devastating moment,” said Clarke. Back at the stables the horse was examined and it was quickly established that it was the tiniest of cuts and he was fine. With the elimination at this stage of a team member in the Grand Prix, the already considerable pressure on Edward Gal and his renowned partner Moorlands Totilas to do well for the Netherlands was even more intense. 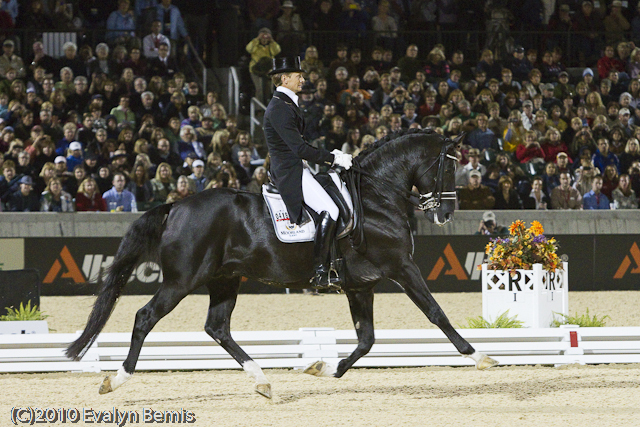 The top three in dressage were unanimous among the judges, as were the lowest-ranked rides. However there were some notable discrepancies with a few tests, and with a goal that there be no more than a 5% degree of variation in scores, the judges met after the team grand prix to review their judging sheets and to watch videos of particular rides. The judges were in sync by the time the top 15 riders presented their individuals freestyles to a sold out stadium on Friday night. 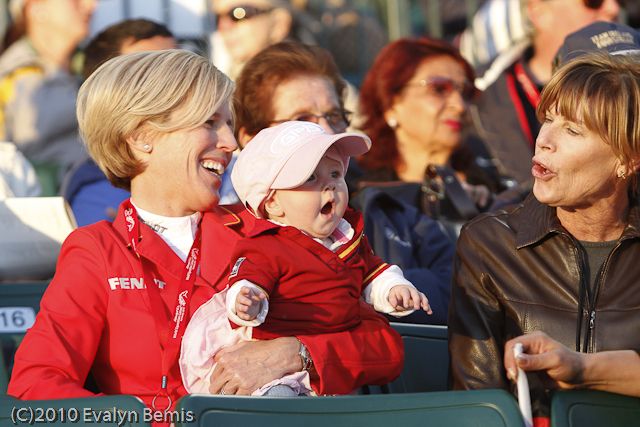 Judge Mary Seefried of Australia commented that the best three rides were obvious, given the harmony of riding. “All the horses were so well-trained and responsive, able to generate their own energy. The precision of riding was remarkable. It was goose-bump territory for all of us watching,” she said. Edward Gal received 10s across the board for his rider marks, as a reflection on the quality of the test and how the rider influences the horse. The judges might have been in agreement over the medal winners but spectators had a different opinion on the fifth-placed pair. Juan Manuel Munoz Diaz of Spain on the PRE stallion Fuego XII put on a thrilling performance, and thunderous applause saluted them before the final halt. When their scores were posted there was audible disapproval. Asked later if there is a prejudice against Baroque horses, Seefried responded that the Spanish horses can sometimes be “over-expressive”. Watch the video at Fuego XII Freestyle and see what you think. There also is a wonderful story about Juan Mauel Munoz Diaz and Fuego XII at eurodressage.com. That friendliness was evident throughout the Games. There were handshakes, pecks on the cheeks and hugs all-round on the medal podiums. The winner of the endurance race, Maria Alvarez Ponton of Spain, said she wanted Sheikh Mohammed [bin Rashid Al Maktuom] to be the World Champion. “I think he deserves it,” said Ponton. “He’s the person doing more for this sport in the world.” Ponton won despite being sleep-deprived as the mother of a 7-week old daughter. Sheikh Mo, as he is affectionately called in Kentucky where he is a major racehorse owner, finished in 2nd place a mere 55 seconds behind Ponton. He had to skip the awards ceremony to attend to state business as Ruler of Dubai. The Final Four in Jumping promised to keep no secrets from each other about their horses. Having already come through five rounds of jumping over four days with the least number of faults out of 121 entries, the top four riders now had to ride each of the others’ horses with only three minutes to get to know them and allowed only a practice jump over a vertical and an oxer. All this took place under the lights in full view of the sold-out stadium. This unusual format is only used at the World Championship. Phillipe Le Jeune said he was looking forward to riding the other horses and thought it would be fun. “We are all fair play competitors,” said Rodrigo Pessoa, “We won’t try to hide anything.” Eric Lamaze, reigning Olympic champion, expressed it best, saying, “I think it is all for the welfare of the horses. These are all great professionals here.” And the fourth and youngest rider, 28-year old Abdullah Al Sharbatly, wished the best for all the riders and predicted a surprise. Pessoa may have used up all his luck in the saddling enclosure when he had to dance quickly to avoid being kicked by Al Sharbatly’s feisty mare, Seldana di Campalto. She did not like the idea of a strange saddle being placed on her back. Once Pessoa was abroad, however, the mare settled down to business and put in a fault-free performance for him. However, Pessoa had already incurred 4 faults abroad his own HH Rebozo in the first round over the course of ten jumps and he had two more rails on Le Jeune’s mount, Vigo d’Arsouilles, in the final round. This dropped him out of the medals. Eric Lamaze lost the silver medal to Abdullah Al Sharbatly by the difference of one time fault but he did not seem disappointed to settle for bronze, judging by the huge smile on his face on the medal podium. A broken foot had abbreviated his preparations for the Games so perhaps any medal was better than he had imagined possible. Or maybe it was because his horse, Hickstead, had earned the Best Horse award by jumping 44 fences without a single knockdown. Phillipe Le Jeune won the gold as the only rider with four clear rounds. As he dismounted from Hickstead, the horse he had said he was most looking forward to riding, he threw his arms around the stallion’s neck for a long hug. Then he went over and hugged his own horse, Vigo, and only after that did he start hugging people. At the airport the next day on his way back to Belgium, Le Jeune said he was looking forward to getting home to share his achievement with his family and only then would it seem real. Nightmarish must have been the feeling for Isjbrand Chardon when he discovered his carriage had been vandalized. The Four-In-Hand Dutch driver pulled the cover off the carriage shortly before he was due to start the marathon phase to find the seats slashed, oil poured over the back of the carriage, and brake fluid on the ground underneath. These carriages are like mini-Mercedes in quality and cost (think $40,000), yet another driver immediately offered his to Chardon. All the team managers agreed to let Chardon move his start time to the end. With that extra 20 minutes he was able to determine that he could still use his own equipment, obviously his preference. Only when he had completed the five gates of the first obstacle in the fastest time of the day was he able to approach the entire course with confidence and concentration. He finished with the overall best time in the marathon. Eventing was not without its’ share of drama. Simone Dieterman (GER) was in third place after dressage and she made it all the way to the last fence on cross-country before an uncharacteristic stop by her horse Free Easy NRW deposited Simone on top of the jump, in full view of the finish line. She suffered humiliation more than anything else but was automatically eliminated for the fall. Italian rider Marco Biasia was stopped on course at fence 23 so that his horse Gandalf the Grey could be checked and although they were cleared to continue, Marco misunderstood due to the language difference and thought he was eliminated. Becky Holder of the US was in third place following a brilliant cross-country effort but sadly had to withdraw Courageous Comet before show-jumping as a precaution due to some heat in a front leg. On the good news front, three members of the gold-medal-winning British team remarkably finished on their dressage scores, as did 6 other competitors, and Canada’s team stood atop the medals podium for the first time since 1978, crediting coach David O’Connor for their surprise success. Reining sold-out the 6,000 seats in the newly-built Alltech indoor arena. The US Reining team won gold, as they were expected to do, and suddenly cowboy hats sprouted everywhere. The Boot Shop in the trade fair did a bang-up business in western boots and glittery belts with huge buckles. German fans were visible everywhere in their Stetsons dyed in the national colors of red-yellow-black. Lyle Lovett and Team USA competitor Tim McQuay co-owned Italian Marco Ricotta’s horse Smart and Shiny, claiming the reason they let an Italian ride the horse was that the Italians throw the best parties. Certainly the Reining horses had the best bling and the best hair at the Games. Vaulting also attracted sold-out audiences to the Alltech Arena, where they cheered for acrobatic feats of strength and derring-do. Gorgeous horses that would have fit right in with the elite athletes of Jumping and Dressage patiently and smoothly cantered in circles while young men and women showed their skills in the compulsory, technical and freestyle tests. 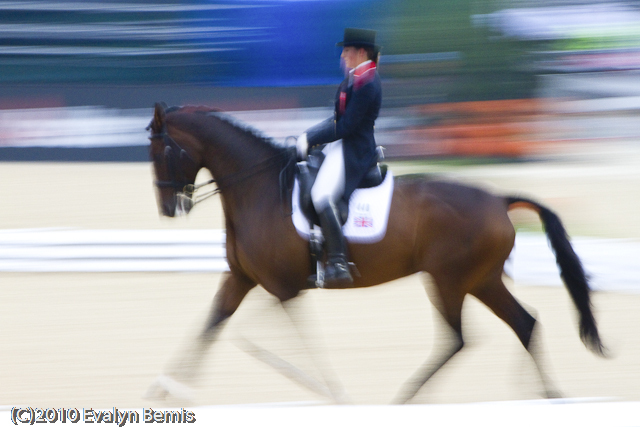 Para-Dressage featured athletes that had to overcome physical challenges to be able to ride. Riders competing with disabilities ranging from Grade 4 (a deformed hand; small loss of motor control) to Grade 1a (no legs; cerebral palsy, blind) are allowed modified equipment such as custom-fitted saddles or using two whips. It was important to these athletes to be included in the Games for the first time. The riders showed they could cope with their horses reacting to throngs of spectators and with the busy stabling area. They performed complex patterns in an arena decorated with flowers, and joyously gave interviews and greeted well-wishers. They demonstrated to the world the unique grace and freedom that can come from partnering with a horse. Anne Cecilie Ore, one of the Para-Dressage riders from Norway, has been blind since the age of 14. When WEG board member Becky Jordan learned that Ore was interested in trying reining before leaving America, she arranged for her daughter Lyndsey Jordan, a two-time world champion, to give Ore a riding lesson. Within 15 minutes of sitting in a western saddle for the first time, Ore was cantering around the ring aboard Blazin, a 10-year-old quarter horse. With Jordan calling out cues, Ore was soon taking Blazin through spins and sliding stops. When it was time to dismount, Ore was all smiles. “It was like a dream since I was 11,” she said. “The really fun stuff was the sliding and the spins. When the spins are slow you get really dizzy, but when you go faster you are not so dizzy. Not like I had imagined it”. And probably not like most people would have imagined a blind person could ride. That sums up what could be said about the Games in general – exceeding expectations, demonstrating the courage and ability of the human-horse connection, going for the gold. Laura Kraut – “I could pick out George [Morris, Chef d’Equipe of the US Jumping team] yelling ‘Gallop, Gallop’ from all the way across the arena”. Laura and her horse Cedric had the only fault-free round for the US on the final day of team competition, a day of ignominy for the US team ending in 10th of 10. 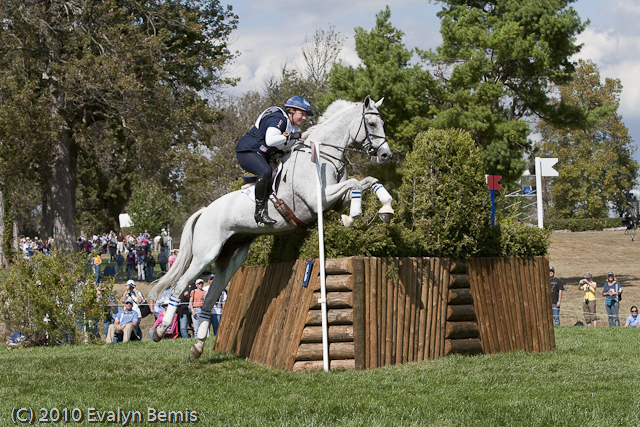 Jumpers had nothing but praise for Conrad Homfeld’s course designs. Kevin Staut of France, the #1 rider in the Rolex FEI world rankings, described the courses as being really fair. “The speed class had faults everywhere; the next course was a little bigger; and the final round of the team competition was much harder given the tension with the team standings being so close. Tonight we had a good fight,” said Kevin. The French earned the silver medal behind Germany in first place and Belgium in bronze. There were complaints of jacked-up hotel prices in the Lexington area. Grand Prix Jumper Margie Engles often has horses on pasture in Lexington and her groom stays at the Knights Inn for $40/night. With prices doubled during WEG the groom was relegated to the living quarters of Margie’s horse trailer. Michael Jung of Germany, in first place after the cross country phase of Eventing, over a course that most riders described as daunting – “I would put the saddle on right now and ride it again, I enjoyed it so much.” He and his horse La Biosthetique-Sam FBW show-jumped clear to end on their dressage score and won by 9 points, an almost unheard-of margin of victory. 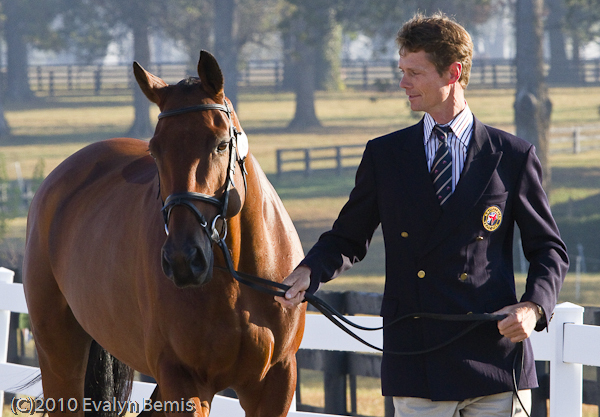 William Fox-Pitt of Great Britain was surprised to move up from 12th place after dressage to 3rd after cross-country in Eventing. 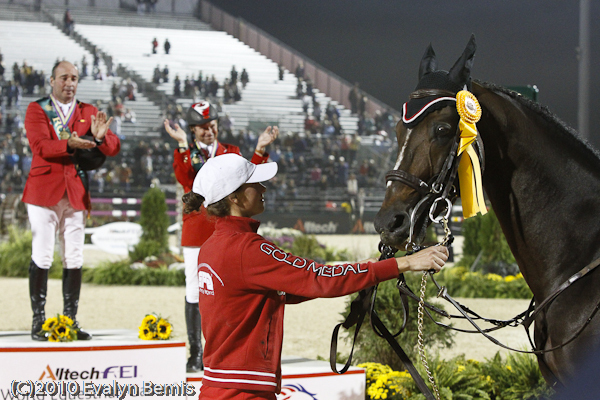 His horse Cool Mountain won the Rolex Kentucky **** in April, 2010 but the Games represented a much tougher field of competitors. Speaking after cross country, Fox-Pitt said he was going to spend a quiet evening in the company of his owners and wife and parents. “Enjoying the moment is very important, since who knows what tomorrow will bring,” said Fox-Pitt. What it brought was the individual silver medal for Fox-Pitt and team gold for Great Britain, whose members Fox-Pitt, Mary King and Nicola Wilson finished with their dressage scores. Phillipe Le Jeune won the individual gold-medal in Jumping for Belgium. His horse, 12-year old Vigo D’Arsouilles, was sired by Nabab de Reve, on whom Phillipe won the team bronze medal in 2002. As is often the case, after that victory owner and breeder Joris de Brabander was offered a lot of money for Nabab and sold him. He told Phillipe he would send Vigo to him and did so when the horse was 7. As the horse began to be successful Brabander got a big offer for the horse but told Phillippe, ‘I don’t care about the money, I want you to have the horse for the next Games’. Laura Kraut has an 8-year old gelding by Vigo, Tortola, who is showing great promise. She stables her horses in Belgium, just down the road from Le Jeune, who often schools his horses with Nelson Pessoa, father of Rodrigo. Eric Lamaze’s horses also reside in Belgium when he is in Europe competing at the indoor shows. Abdullah Al-Sharbatly is moving his horses from Saudi Arabia to now be based in Belgium with his trainer in the lead up to the 2012 Olympics in London. Belgium looks like the place to be. Rumor has it that Saudi Equestrian put up $20 million Euros to buy horses for WEG and the Olympics. Al Sharbatly had only ridden in two shows with Seldana di Campalto prior to WEG yet was the only rider to have five clear rounds coming into the Final Four. Khaled Al Eid’s horse, Presley Boy, was supposedly purchased by Saudi Equestrian for $6+ million Euros just three weeks prior to WEG.